For the last twelve months I've had something of an accessory addiction and have coveted a number of male bracelets. If you didn't see my wishlist from 2015 you can here. This however is just the tip of the iceberg and on Pinterest here I have a rather large board that has everything from £5 to £5,000 (a man can dream) bracelets to adorn my wrist. It was on Pinterest that those purveyors of fine jewellery for men Atolyestone London got in touch and asked if I had ever seen their range. I must confess, at the time I hadn't heard of them or seen their website but with two clicks of the mouse I was in luxury bracelet heaven. As a bit of a disclosure, I was offered the opportunity to pick a product from the site and then entered a period of calm (read neurotic indecision) as I tried to settle on one particular bracelet. In the end I opted for the Lava Skull Beaded Bracelet at £70, fired off my request and sat back with the giddy excitement of a four year old on Christmas morning. I didn't have to wait long. My ordered was placed on Saturday and after another ugly Monday I arrived home to a card from DHL advising that the bracelet had been signed for by my neighbour (cheers bud). I was that excited about my new bracelet that I (for the first time in my thirty seven years) kept checking the online tracking system from DHL. The anticipation could not have prepared me for the sheer "wow" factor when opening the package. Not only did the bracelet come in the chunkiest and weighty box, it oozed quality, and that was before I had opened it. Opening the box brought a bigger smile to my face - there is was in all it's glory - the black lava stone wrapped around its own little cushion, the sterling silver skull staring back at me. Pleased is an understatement of epic proportion. Well made, oozing class and more importantly, looking stunning I am delighted with my choice. Yes, Atolyestone London in my view falls into the luxury category but they are well and truly worth the additional expense. My ASOS bracelets now look like paupers when placed next to my new offering, which means that I'm going to have to upgrade my collection (double edged sword time). With colours and ranges to suit all tastes, and bracelets, bangles and cuffs that cost from £40 to £245 there is something that will appeal to every taste (it's not all skulls). If you’re not treating yourself, these would make a perfect gift for the man in your life. My fella isnt a jewelry man, but I know a few people that would love this. Looks great, I love the skull! Have you still got the skull shot glasses? I think I have an accessory addiction too and I love anything with skulls! Ooh I like that a lot! I like the other pieces too but the skull version is gorgeous. It's a gorgeous choice for you. Can't ever see Mr A wearing anything like this though! Love it. My best friend and her boyfriend would adore this, I will show her! If you love this you should definitely check out my friend Terry's collection with Male Model James Smith, (on twitter @terry_terry) right up your street. Looks very stylish, great choice! My husband would LOVE this and the lion head one also. They are so unique! I would love one of these. But I have found with some bead type bracelets that they are not as big in real life as they look in the picture. Is that your experience Stephen? Not my experience, but my friend did mention that she thought it was smaller than it looked in the images here. I thought her lack of depth and size perception was down to her massive consumption of wine though, and I'm usually right. I do love the weird and the wonderful, although I'm massively drawn to anything skull related at the moment! That's a great bracelet Stephen, totally get why you like it and it goes well with the watch too. I need to have a look at that board to see what you've got on it! Wow ! So many stylish bracelet in different color, I love to wear bracelet like you, I have a huge collection of bracelet in my store. 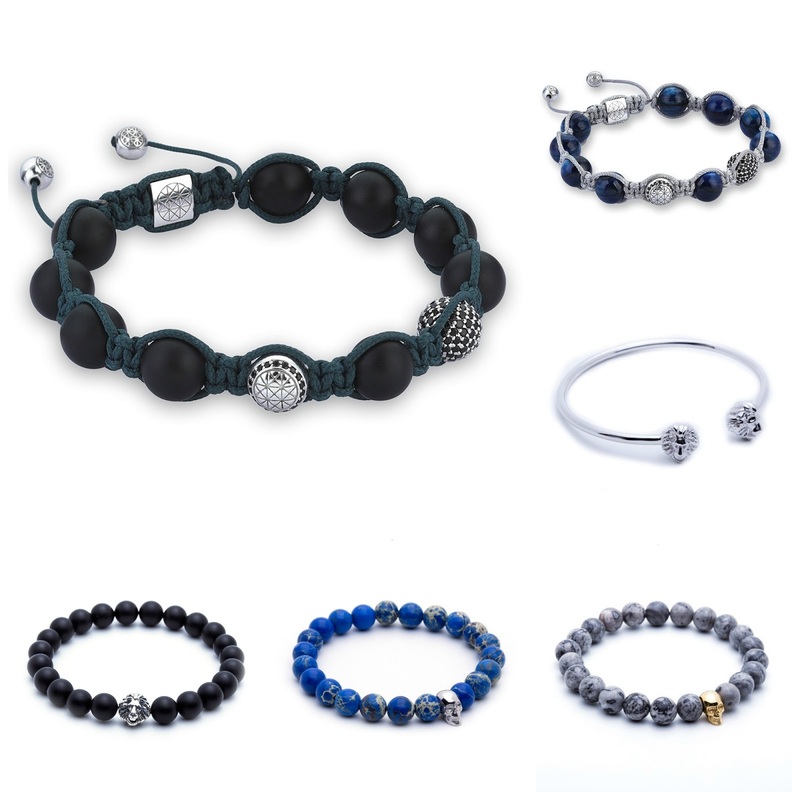 Buy the best charms for bracelets beads and sterling silver jewellery at affordable price.